Seaport Residences, a slender stack of condos under construction at the edge of the Financial District, has reached its final, 51st floor. 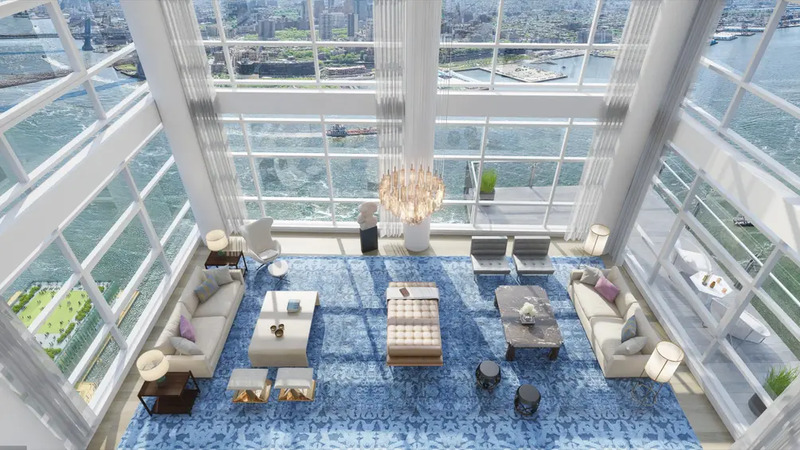 The 670-foot-tall skyscraper is the second tallest waterfront condo in the city after One Manhattan Square nearby. 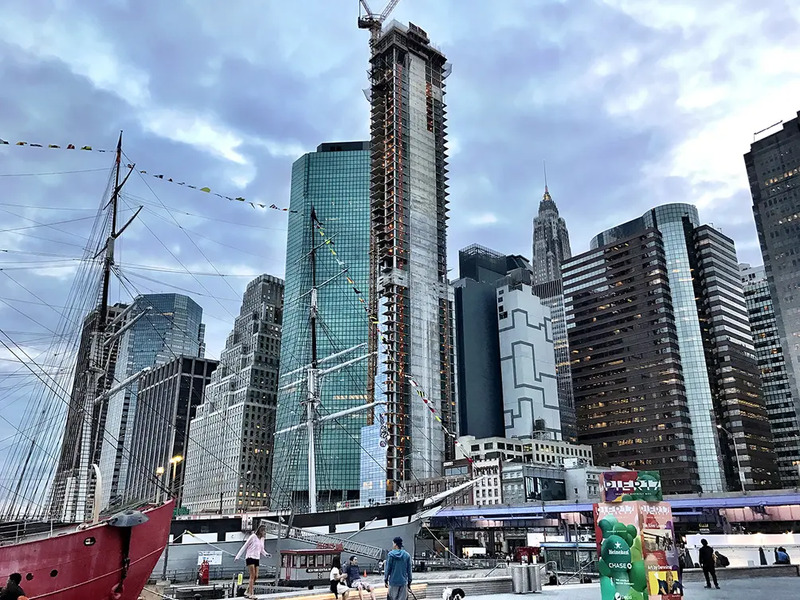 Addressed at 161 Maiden Lane, close to Wall Street and the South Street Seaport, the 170,000-square-foot venture is being brought to market by Fortis Property Group, the company behind the LICH redevelopment in Cobble Hill, Brooklyn. The Seaport Residences will accommodate 80 condo residences upon opening next year. Sales began in spring 2016 and the target sellout now stands at $273 million, which pencils out to $3.41 million a pop. According to the listings, there are no availabilities and 73 units are shown in-contract. 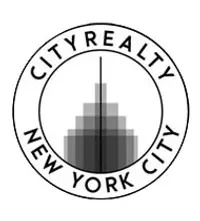 Asking prices began at $1.22 million ($1,748 a foot) for a one-bedroom and culminated in a four-bedroom penthouse once listed for $18 million ($4,009 a foot). Among the building's most notable pending deals is a 46th-floor duplex snapped up by Douglas Elliman broker Fredrik Eklund, star of Million Dollar Listing New York. The unit had an ask of $4.6 million. Groves & Co. are the interior designers of the tower's public and private spaces. 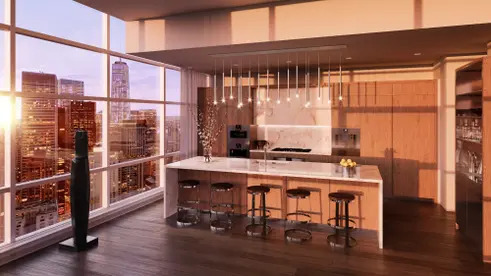 Residences will feature hand-stained oak flooring, floor-to-ceiling triple-paned glass walls, and up to 11-foot ceilings. Amenities will include a lobby lounge with a double-sided fireplace, a fitness center, a children's playroom, a waterside terrace, and The Water Club, which will have a floating glass-edged infinity pool, a digitally activated rain shower, a relaxation lounge and a sauna and steam room. 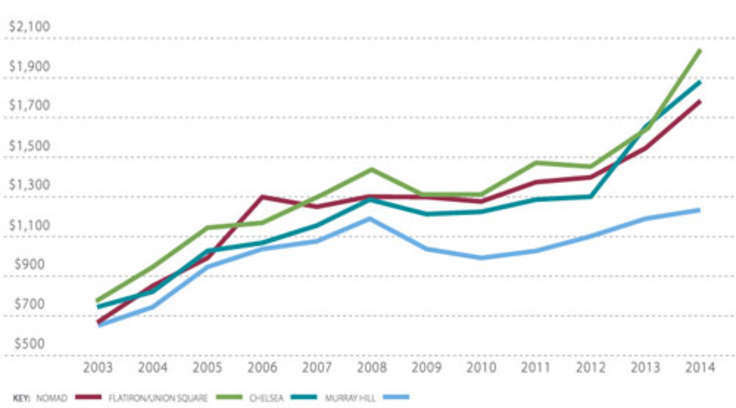 The spire joins a growing crop of super-slim residential towers that have taken Manhattan by storm in recent years. Its design by Hill West Architects measures just 35 feet wide above the tenth floor at its South Street elevation. 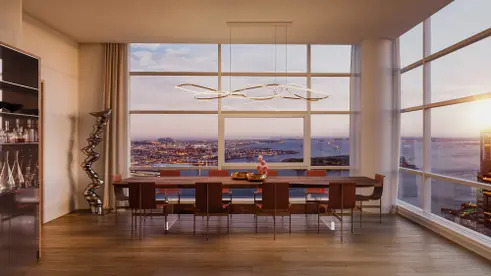 Every home in the building will have glorious sunrise views over the East River, the bridges, and Brooklyn. To fully capture these iconic panoramas, the tower is dressed in an all-glass facade that is heightened by an array of balconies that adds dynamism to the slab design. According to the architect's page, "Hill West designed a building that embodies the essence of living on the water by day or by night." The designers digitized images of light on water to create a pattern by which the four types of glass on the building exterior "mimic the sparkle and drama of the water and reflect the sky." Upon opening, the tower's pinnacle will be illuminated with long baguettes of lights, "wrapping its crown like a modern residential lighthouse in the city port," explains the architects.